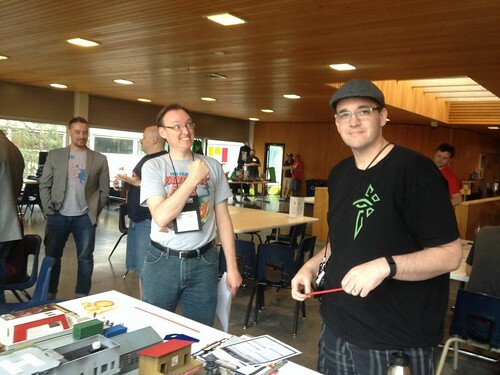 Almost two weeks ago, I joined fellow Conscripts Greg and Dallas in running games at PrairieCon 2016 (the 37th running of this long-standing event!). 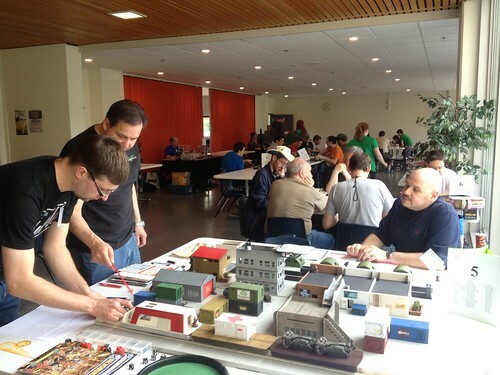 The program shows the variety of board, role-playing, tabletop, and miniatures games offered. PrairieCon weekend capped a week of being away from home. I turned a short business trip to Riding Mountain National Park into a mini-vacation with my wife, Jen. (I heartily recommend the Elkhorn Resort, and the restaurants, shops, and hiking trails in and around Wasagaming and Clear Lake MB as restful vacation destinations.) So, for a week, our car was packed with not only our luggage, but a set of golf clubs, two briefcases, a laptop, figures, and enough urban and scatter terrain to cover a closely packed 4'x4' table! 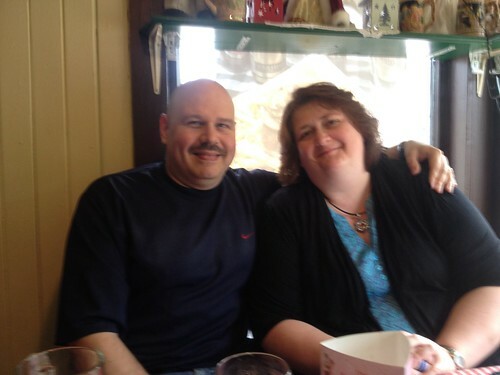 Arriving early in Brandon, MB on the Friday, Jen and I met up with Kim and Conscript Byron, We had a great German meal at Hansel and Gretel's Schnitzel House. 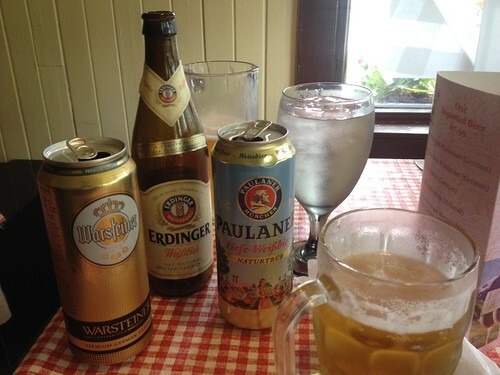 To go with the spaetzle, and the chicken and pork schnitzel, what better than some German beer! I ran Necromunda twice on Friday night, using the Total War scenario from the Necromunda by Night campaign. Along with my terrain, I brought my own Spyre Hunters, and three gangs thoughtfully provided by Dallas, his Delaques, Redemptionists, and Adeptus Arbites. First game, the table was crowded, with the Adeptus Arbites and Delaques allying against the outlaw Redemptionists and Spyrers. The players make quick work of the "monster" (this time porteayed by a Talisman figure with a big stick). 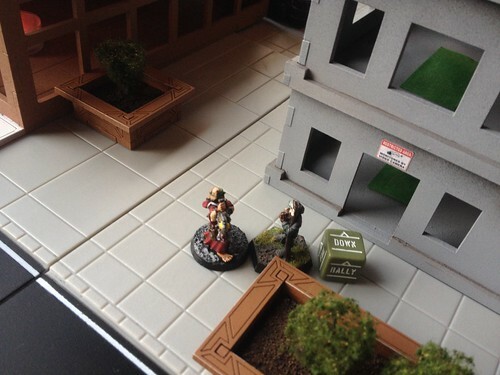 Below, the players include Astronomi-con's ChristianA and Conscript Byron. The turning point was when several Delaque reinforcements were put Down by a Redemptionist with a single-shot flamethrower! The Redemptionists and Spyrers ended up holding the field. In the second game, one of the players failed to show, so I refereed a Delaque (Conscript Perry) vs. Redemtionist (Cliff) fight. As the (real) Sun set, I lit up some battery operated tea lights for atmosphere. 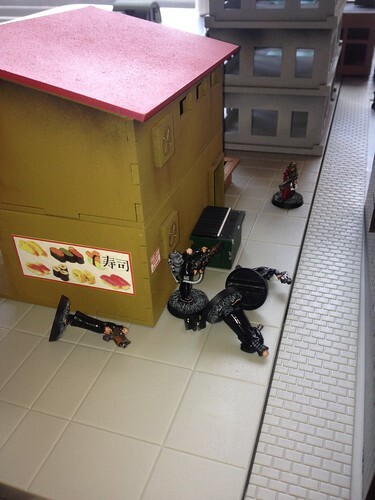 ...until Downed by a one-two meltagun and giant chainsaw beat down. I was using Bolt Action order dice as ersatz status counters. I ordered from Chessex two sets of custom Necromunda status dice. They arrived in the mail too late for PrairiCon, but I used them in a recent game I had pitting my Spyrers against Levon's Van Saars; Levon thought they worked very well. 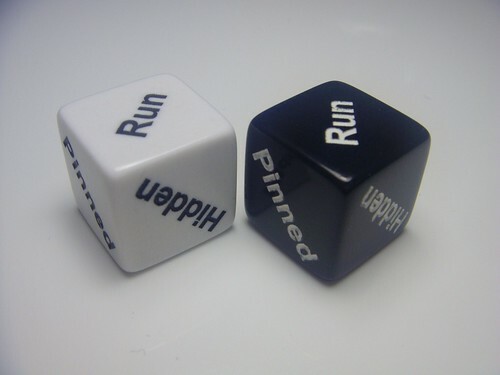 Below is photo of the test dice provided by Chessex ( I shall post about my game with Levon later). 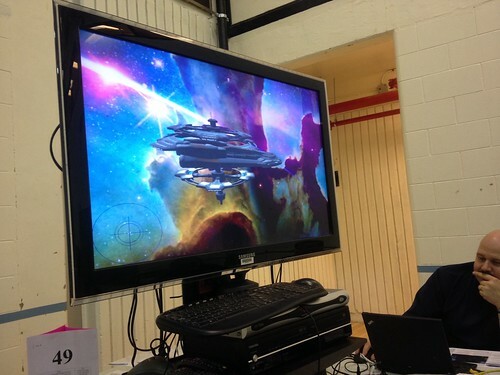 [From the convention program:] "Artemis is a multi player, multi-computer networked game for Windows computers, and now iOS devices too. 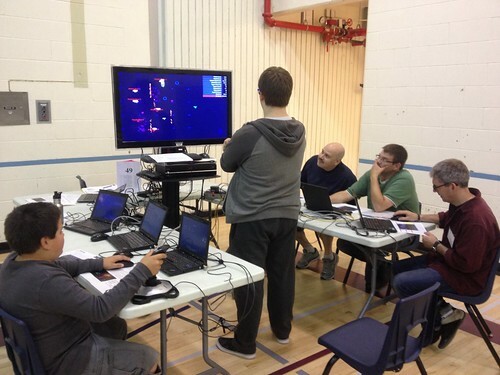 Artemis simulates a spaceship bridge by networking several computers together. 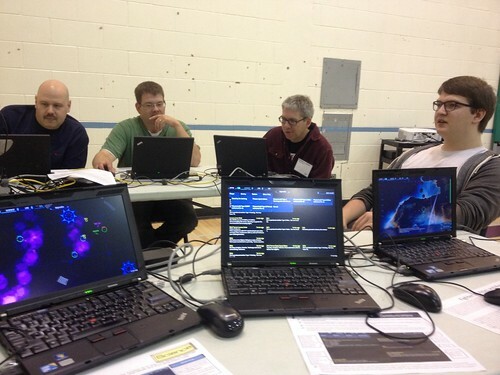 One computer runs the simulation and the “main screen”, while the others serve as workstations for the normal jobs a bridge o fficer might do, like Helm, Communication, Engineering, and Weapon Control. Artemis is a social game where several players are together in one room (“bridge”) , and while they all work together, one player plays the Captain, a person who sits in the middle, doesn’t have a workstation, and tells everyone what to do." This game was supposed to be run in every time slot. Unfortunately, there was no game-master at the late Friday night slot Byron, Dallas, and I played in! 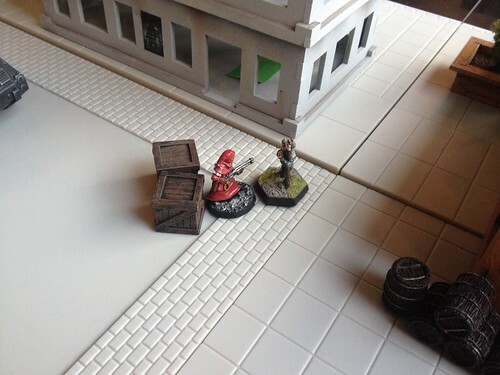 Fortunately, the player Captain had played before and was able to guide us through a scenario. It took awhile before I got the hang of running the Science station. It was fun working together to try and fight our ship against a series of hostiles. Settlers is one of Jen's favourite games. 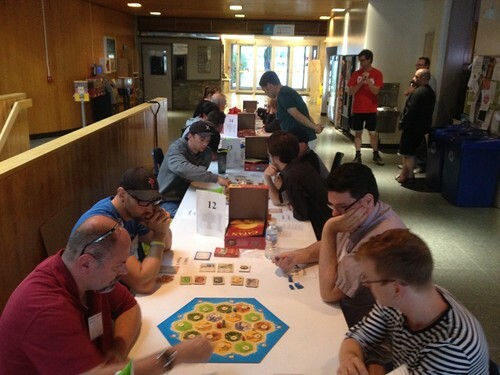 PrairieCon hosted the Canadian National Settlers of Catan Championship. It was cool to see the variety of players who participated, both young and old. IIRC, the winner won airfare and hotel for the World Championships! 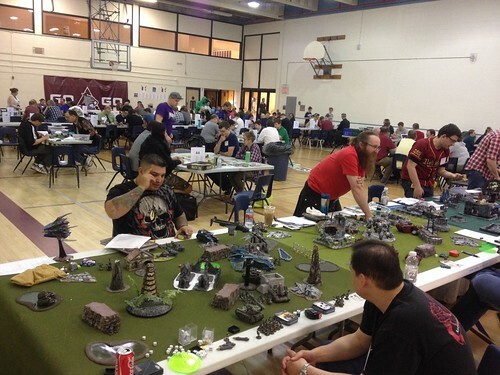 There was a 40K tournament on Saturday. 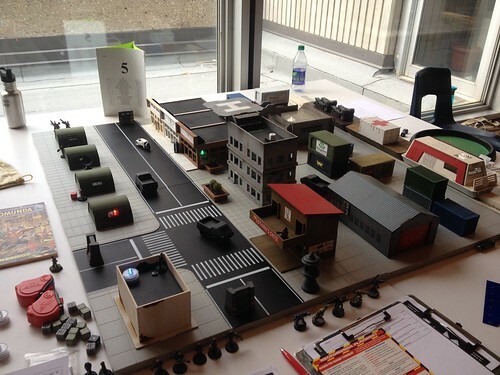 The participants fielded some nicely modeled armies. 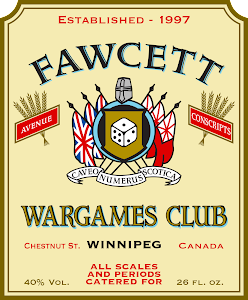 I still play 40K, but it was interesting to note several longtime 40K players who weren't playing at the tournament (Dallas, Greg, MikeK, and myself, to name a few). Greg ran his truly "epic" 30K Smackdown on Sunday morning. I have been following the progress on his beautifully painted forces. 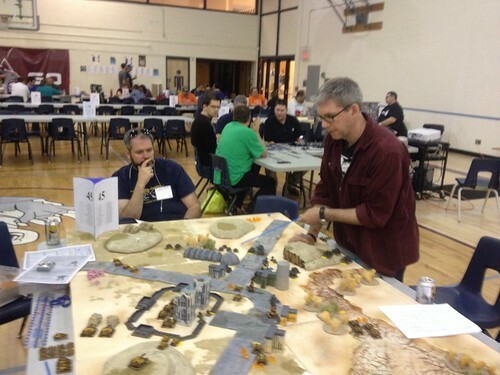 His desert terrain table is also real eye candy. All in all, I had a great time at PraireCon. I highly recommend the convention, which has something for just about anyone's gaming taste. 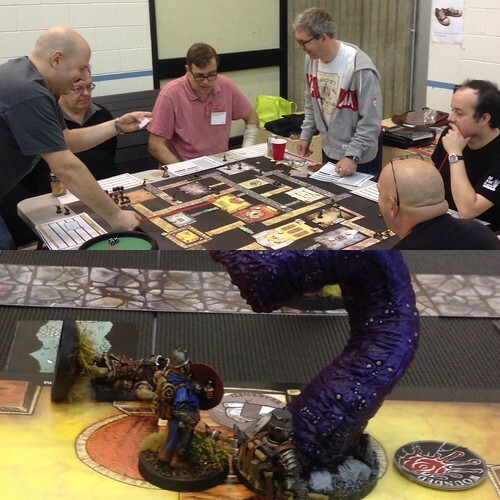 Great job at PrairieCon Dave - your Necromunda stuff is excellent, great to see interest in the old school "specialist" games.